This cue has an interesting story. I had looked high and low for an Ebony on Ebony Schick. There is only one other one that I know of (Bill says there may be three, four max), and I believe that one belongs to someone who doesn't care for Ebony! Anywho...I thought Valley Forge may bring me to the Ebony on Ebony Schick I was searching for. I visited every booth looking for one, but to no avail. The very last day of the show I was at High End Cues booth. I had been there at least 10 times over the course of the show. As I was getting ready to go back to my booth I see a cue laying on the table (not in one of their displays) and it did not have a wrap or finish. I picked it up and it was an 8pt Ebony on Ebony cue. I looked over at Kenny and said, "Hey...what is this???!!!" 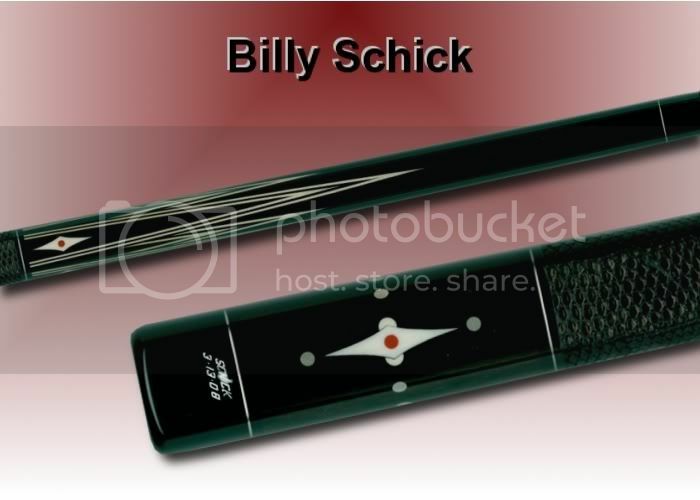 He said, "it's a cue Bill Schick built for me and he brought it to the show for me to see. He is going to finish it when he gets back home." Needless to say I had to have it. Bill told me it is only the second 8pt cue with veneers on all 8 points he has ever made. The picture does not have the bumper because Bill forgot to put it on when he shipped me the cue. He has since sent me the bumper. Must be a sign of getting old! wow, did I say wow? I meant to say WOW. now that's an ebony on ebony cue. Oh, my . . . . .